From the cradle of Stokowskian Scheherazades, that luxuriant Philadelphian hot house, comes a welcome reissue of Ormandy�s 1962 traversal. Accorded the usual rather trenchant and unsophisticated CBS sound of the day the performance still ascends vertiginously to amongst the foremost performances in the catalogue through virtues of sonority, structural acuity, solo excellence and sheer varnished finesse. Leader Anshel Brusilow had a few good opportunities to shine, almost all of them with Ormandy � specialists will know his recording of Yardumian�s Concerto, as well as Heldenleben, the Bartók Portraits and Quattro Stagioni amongst others. His fast vibrato, sweet tone and seamless elegance are treasurable components of a recording of many such moments. Yes, that harp in The Sea and Sinbad�s Ship is miked so closely you can hear each string quiver in Philadelphia�s Town Hall acoustic; and the trumpets� braying is perhaps rather too abrasive for sensitively blended ears, though undeniably exciting. Ormandy�s control however is instructive. He can create tension without artificiality and can drive a movement forward without sacrificing detail. In The Story of the Kalander Prince it�s of some considerable interest to hear him arrest the rhythm at 5�30 and to hear the drastic diminuendo before the movement's concluding peroration. Some might object to a sense of theatricality but not me. Gravity and lightness coalesce in The young Prince and the Young Princess � and how acutely the harmonic implications of the movement are laid bare at 5�00 et seq. Sharp rhythmic delineation, chattering woodwind and staunch orchestral management lead to a triumphant ending, and a performance of genuine stature. 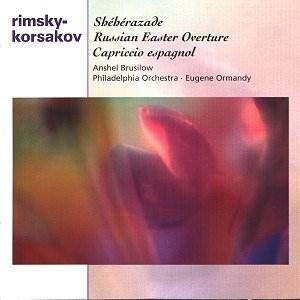 I always enjoy hearing the Russian Easter Festival Overture in this luxurious performance. Mussoursgky wasn�t the only Russian composer fundamentally to influence Jan�cek � here is the Slavic seedbed that must have influenced the declamatory trumpet writing, as well as the sense of rhythmic elasticity and suspension in the Sinfonietta for one. The recording was made in 1959 in the Broadwood Hotel in Philadelphia and still sounds spaciously assertive. To complete the pleasures of this self-recommending disc comes the Capriccio espagnol from 1965. Colour, vivacity, nobility - a beautifully sustained Variazioni � mark out the expected delights, Brusilow again reappearing to notable effect, especially in the filigree and jaunty Alborada and in the trenchancies of the Scena e canto gitano. A splendid disc in every way. The Scheherazade is a strong front-runner and though not quite in the league of my benchmark Kletzki performance it, like all the performances here, is brimful of vivacity and engulfing generosity.